We return with another session from our man in Los Angeles, Dday One. 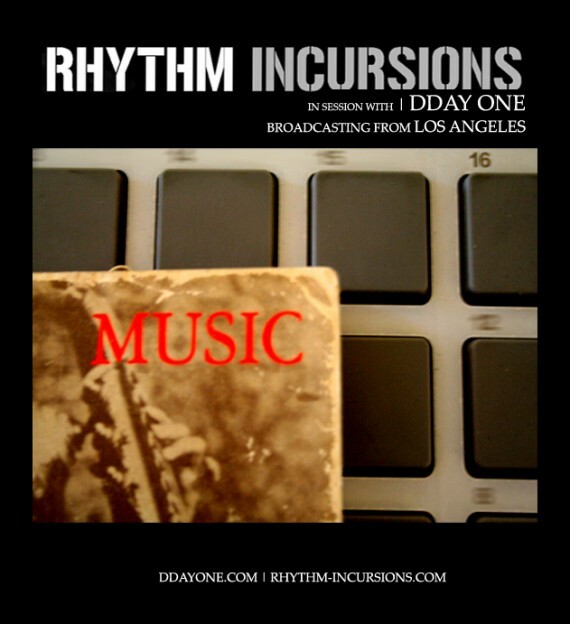 It’s been a quiet winter so far on Rhythm Incursions, mainly due to other commitments, and we’ll work to return to a more regular schedule in the new year but in the meantime Dday takes care of business with a usual mix of new and old goodies from both his own Conten(t) label and beyond. Music from Ital Tek, Long Arm, Scuba, Diplo, Kidsuke, Latryx, Om Unit, Pixelord, DJ Scientist and more. As always with the In Session broadcast you can download the show directly via Dday’s bandcamp or if you’re a subscriber to our iTunes/RSS feed directly from us. Embed below. This entry was posted on Monday, November 19th, 2012 at 3:18 pm. It is filed under Podcasts, DDay One - In Session series and tagged with Dday One, The Herbaliser, Scuba, Two Fingers, Om Unit, Ital Tek, Pixelord, Gangstarr, DJ Scientist, Long Arm, Mantronix, Kidsuke. You can follow any responses to this entry through the RSS 2.0 feed.